excess guild store tokens? I've earned over 1 million to date, and I never have more than a few hundred sitting around. There's so much to buy in there! Not speaking for me. I have nothing to but in ship store except zetas. More than happy buying gear from guild store. Bigger fish to fry than excess currency that can be spent. Addition of neutral tag confirms they will be adding the banking clan pre Clovis. My dreams have come true! OMG, but SIth Raid, Sith Raid Sith Raid please. I mean this is great and it looks cool and looks like like it will be a huge improvement. Well done. Thanks, but the state of the raid is so much more a drag on this game right now than making mods easier. I'm not sure why that isn't not just a priority, but THE priority. Also I thought it was said we'd be getting details on the Raid changes soon and perhaps I'm having hazy memories I thought the Sith Raid changes were going to be rolled out with Mod changes, but I may have to go back and reread that thread. In any case, pretty please with a cherry on top get the raid fixed before anything else. That is all most of us care about right now. It's not a zero sum situation. Just because other things are being done doesn't mean other projects, like the Sith Raid, aren't being worked on as well. Ha. Fair enough and I hate to be the **** in the punch bowl or take away form what was done, but I honestly don't acre about any changes or new content apart from getting the Sith Raid in a semi-enjoyable state. I have an active raid in my guild right now and I've thrown only one team against it on auto and I couldn't possibly be bothered to be motivated enough to send any more. I've officially reached my limit on caring about it and wasting my time. These changes are in fact great. Awesome I'll even say. They would be even better received and appreciated if they were on teh heels of a Sith Raid overhaul that is drastically overdue and needed. I hag to go into the store for update ios game did not notify it. Some people, no doubt, are more interested in STR changes, but there are plenty of others excited for the mod updates. Blanket statements about how much better these changes would have been received after Sith Raid adjustments seem to take a great deal under assumption. You feel that way, certainly, which is perfectly fine, but not everyone does. 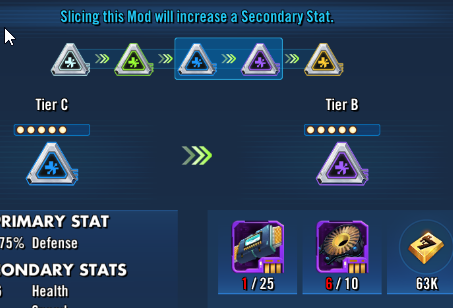 Part of improving STR is better mod stats. So this update is directly related to qol in raid. Jaxom that's true, but as soon as the Sith Raid came out the the voice of sith pain drowned out the mod pain. That tells me that the Sith changes are more of a sticking point for the community and should be a priority. Let's do a simple poll. What would you (plural:community) rather see first? and I'll allow all the other stuff they added in, all of which is great, well done and something we want. I.e None of it is fluff is what I'm saying and they did a nice update with good stuff. I'm not talking about one or the other and one is dropped completely. I'm talking about which would we as a community rather see addressed first? For me it's SIth Raid. Not even close. Can't wait for this to roll out so we can get on to addressing the Sith Raid changes! That's a stretch. That's like saying another JTR event would solve the problem. Oh wait they did say that and tried that.......The problem is not mods, better mod stats, more JTR in the world. It's not even close to any of that. If they think it is I'm scared of what the fix will be, but fortunately I think they have moved beyond that logic. Fair enough. To be honest I too am excited. Again though if asked what would I like to see first or have them prioritize, then me personally, I would like to see them focus on STR. I'm not sure if I'm in the majority or the minority here, but I can't be alone given how many people spoke up in the original STR feedback thread. Just checked the costs of slicing various mods. It made me feel like vomiting the amount I gathered these last few days. Forums will be full of vitriol soon I guess. I certainly agree I too am ready for str improvements. I also think increasing your toons damage output and survivability definitely helps in the raid. They also already stated mods will be first so the complaints are delayed. This is blue to purple. Even getting our arena mods sliced fully will take aeons for non spenders. Will see. Well, I farmed Hard Nodes all week, which yielded enough to upgrade 2 greys to green. But we don't REALLY know how bad it will be until the final farm locations are unlocked. The bonuses were just something to get us started. @CG_SBCrumb Perhaps some reassurance that we will see better results when we can farm mats normally? So after the update, I have the mod energy, but when I go into mod challenge it still requires normal energy? Tier 9 has been noy released and neither has the ability to farm slice mats. So its best to just wait. This was answered earlier in the thread.